Overview Manufacturer: Vantec. 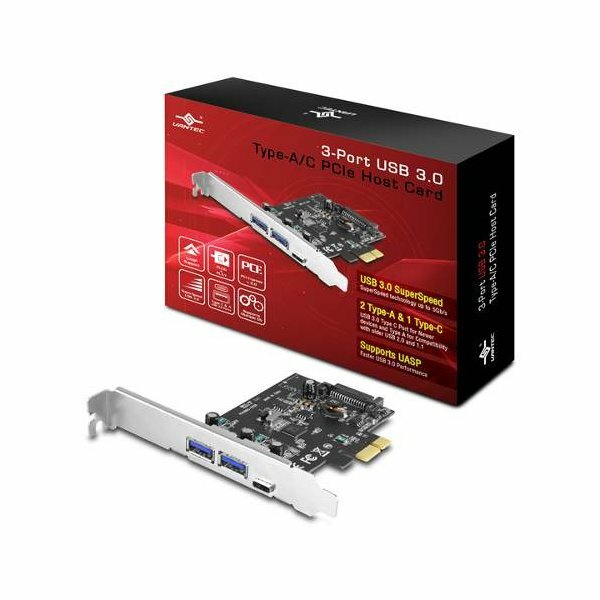 The Vantec 3-Port USB 3.0 with two Type A and one Type C PCIe Host Card is design to offer both USB interfaces for current and newer USB Technology. It will work with current Type A devices and newer Type C devices with compatibility to legacy USB 2.0 or USB 1.1. The ports provide better power for any USB bus powered devices and making it a versatile interface for any USB storage devices for transferring files with speed of up to 5Gbps; this allows for backing up of important data such as HD video, high resolution photos in a fraction amount of time. Upgrading your system to the newest USB 3.0 technology has never been so easy with this Vantec 3-Port USB 3.0 Type A/C PCIe Host Card. Manufacturer: Vantec. 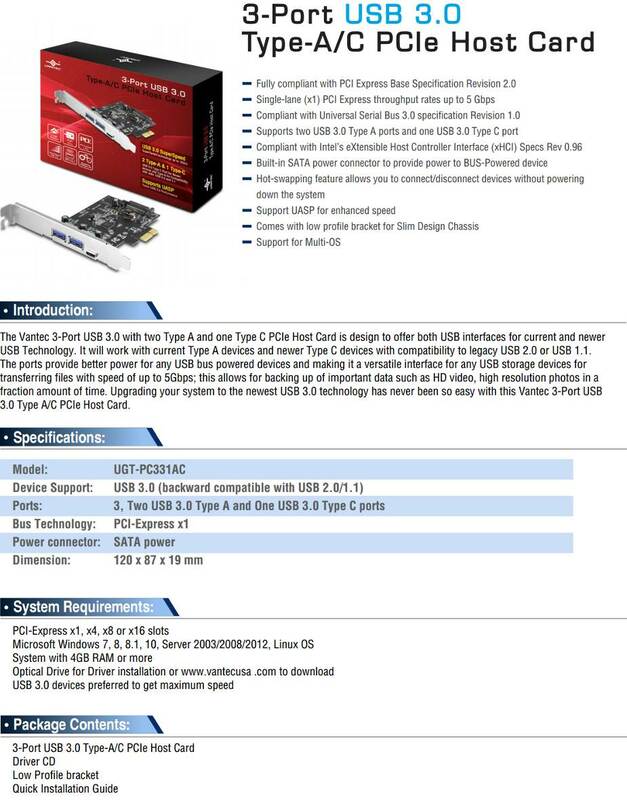 The Vantec 3-Port USB 3.0 with two Type A and one Type C PCIe Host Card is design to offer both USB interfaces for current and newer USB Technology. It will work with current Type A devices and newer Type C devices with compatibility to legacy USB 2.0 or USB 1.1. The ports provide better power for any USB bus powered devices and making it a versatile interface for any USB storage devices for transferring files with speed of up to 5Gbps; this allows for backing up of important data such as HD video, high resolution photos in a fraction amount of time. Upgrading your system to the newest USB 3.0 technology has never been so easy with this Vantec 3-Port USB 3.0 Type A/C PCIe Host Card.